The Green Flag Award winning Guisborough Forest and Walkway is the ideal place to visit and enjoy the countryside surrounding the historic market town of Guisborough. It is managed as a Local Nature Reserve by Redcar & Cleveland Countryside Rangers and extends for 2.5 miles along a section of the former Guisborough Branch Railway line, leading west towards Nunthorpe, and east into Guisborough Forest, which is managed by the Forestry Commission. It contains a variety of habitats, including wetland, farmland and woodland. It is a gateway site to Guisborough Forest and the many public rights of way, which extend to Roseberry Topping and the North York Moors National Park. The site is popular with walkers, mountain bikers and horse riders, being the starting point for a variety of circular walking, cycling and riding routes. School parties also regularly use the site as an outdoor classroom. Attractions on site are children’s play areas, a sculpture trail, a ‘trim trail’ with a variety of fitness apparatus, picnic tables, dipping ponds etc. 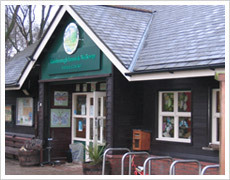 Situated close to the main car park is a Visitor Centre which provides a base for the Countryside Rangers and Forestry Commission Staff, who are available to provide information and help about activities and events. The Visitor Centre facilities include toilets, baby changing facilities and a first aid point. In the exhibition room there are displays, which aim to educate both young and old on various countryside/environmental themes and the heritage of the local area. A small shop serves a selection of souvenir items. Next door is the Branch Walkway Cafe serving a selection of food and drink. The Centre is open daily throughout the year except for Christmas Day - with special thanks to the Cafe staff. There is a large 'pay & display' car park with tickets costing £1 for all day parking. Season tickets are available for £25 - contact staff for details. If you have any queries, please contact staff prior to your visit. Download the latest Guisborough Forest and Walkway Leaflet for more info.